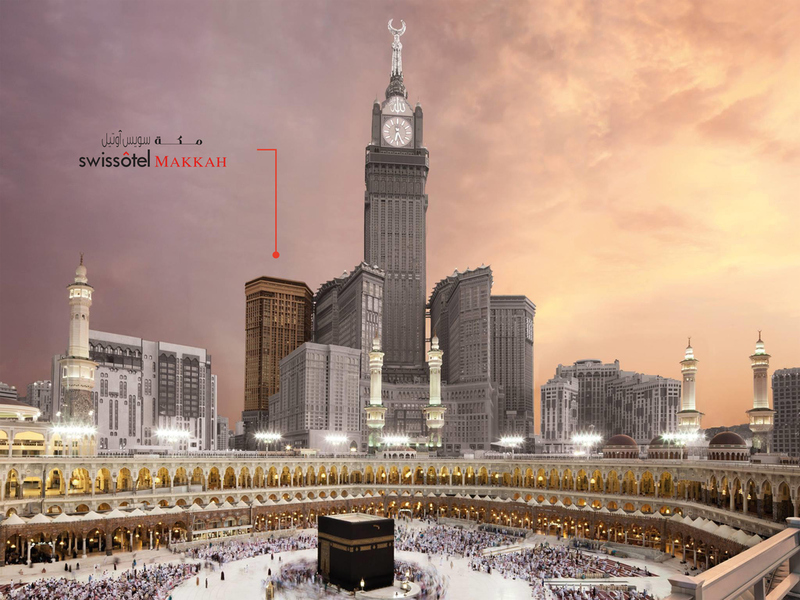 Being part of the luxurious Abraj El Bait Complex, Swissotel Makkah is a design hotel located in close proximity to the Holy Haram overlooking the Kaaba, the Grand Mosque. It boasts Chargeable Wi-Fi and 2 restaurants. All modern accommodation at Swissôtel are decorated with printed carpeted floors. Each suite offers a spacious seating area with a flat-screen TV and a minibar. A marble bathroom is also included. Signature Restaurant offers fine dining with a selection of mouth-watering seasonal menus. Classic Room - The spacious and stylishly-designed Classic Room exudes an air of elegance and tranquillity that charms the most discerning guest. Our Classic Room promises to delight both leisure and business guests with a melange of amenities and warm service. Serving an International buffet for the 3 meal periods with famous cuisine from around the world from Mediterranean to Indian, Chinese, South East Asian and Continental cuisine and not forgetting the local Arab cuisine too. Al-Ruwad Tea Lounge exudes a mix of elegance and tranquility. On offer is an exclusive selection of tea and coffee, complimenting the delicately fashioned fresh sandwiches and pastries. In the beginning the reception girl was not helpful at all because she told us our sweet will be ready after two hours, while we were coming from another country. However, another staff member as I remembered called Maher helped us with small room till our room was ready. Overall, breakfast was good, services were good and the sweet was great. If I will have another chance to visit Makkah inshallah I will definitely choose your hotel. Dear Firas K., We very much appreciate your comments regarding your stay at the Swissôtel Makkah. It is always a pleasure to receive positive feedback. I will share your comments with our team. I am sure that this feedback will serve as an encouragement to all of our staff as we strive to continuously improve the quality of our services. Thank you again for sharing your experience, and we hope your next visit will be as pleasant as the previous one. Dear Khayriah A., We very much appreciate your comments regarding your stay at the Swissôtel Makkah. It is always a pleasure to receive positive feedback. I will share your comments with our team. I am sure that this feedback will serve as an encouragement to all of our staff as we strive to continuously improve the quality of our services. Thank you again for sharing your experience, and we hope your next visit will be as pleasant as the previous one. Dear Hanan B., We very much appreciate your comments regarding your stay at the Swissôtel Makkah. It is always a pleasure to receive positive feedback. I will share your comments with our team. I am sure that this feedback will serve as an encouragement to all of our staff as we strive to continuously improve the quality of our services. Thank you again for sharing your experience, and we hope your next visit will be as pleasant as the previous one. Dear Ahmed O., We very much appreciate your comments regarding your stay at the Swissôtel Makkah. It is always a pleasure to receive positive feedback. I will share your comments with our team. I am sure that this feedback will serve as an encouragement to all of our staff as we strive to continuously improve the quality of our services. Thank you again for sharing your experience, and we hope your next visit will be as pleasant as the previous one. Spacious clean rooms and excellent view. Hospitality is great. However, online check-in is not available and waiting time is around 30min. Another point to consider is the parking fee. It must be lower as leaving the parking is very difficult among the crowd. Deputy Manager could confirm whether there is empty space or not. I had to park outside far away. Parking is a problem. In conclusion, I very pleased with this experience. Dear Mohammad M., We very much appreciate your comments regarding your stay at the Swissôtel Makkah. It is always a pleasure to receive positive feedback. I will share your comments with our team. I am sure that this feedback will serve as an encouragement to all of our staff as we strive to continuously improve the quality of our services. Thank you again for sharing your experience, and we hope your next visit will be as pleasant as the previous one. Dear Mohamed R., We very much appreciate your comments regarding your stay at the Swissôtel Makkah. It is always a pleasure to receive positive feedback. I will share your comments with our team. I am sure that this feedback will serve as an encouragement to all of our staff as we strive to continuously improve the quality of our services. Thank you again for sharing your experience, and we hope your next visit will be as pleasant as the previous one. Dear Wassim U., We very much appreciate your comments regarding your stay at the Swissôtel Makkah. It is always a pleasure to receive positive feedback. I will share your comments with our team. I am sure that this feedback will serve as an encouragement to all of our staff as we strive to continuously improve the quality of our services. Thank you again for sharing your experience, and we hope your next visit will be as pleasant as the previous one. Dear Mustafa A., We very much appreciate your comments regarding your stay at the Swissôtel Makkah. It is always a pleasure to receive positive feedback. I will share your comments with our team. I am sure that this feedback will serve as an encouragement to all of our staff as we strive to continuously improve the quality of our services. Thank you again for sharing your experience, and we hope your next visit will be as pleasant as the previous one. Dear Habiba h., We very much appreciate your comments regarding your stay at the Swissôtel Makkah. It is always a pleasure to receive positive feedback. I will share your comments with our team. I am sure that this feedback will serve as an encouragement to all of our staff as we strive to continuously improve the quality of our services. Thank you again for sharing your experience, and we hope your next visit will be as pleasant as the previous one. Dear Mohammed+moin A., We very much appreciate your comments regarding your stay at the Swissôtel Makkah. It is always a pleasure to receive positive feedback. I will share your comments with our team. I am sure that this feedback will serve as an encouragement to all of our staff as we strive to continuously improve the quality of our services. Thank you again for sharing your experience, and we hope your next visit will be as pleasant as the previous one. Fast check in and out, excellent service, nice staff, and great location. Dear Omar A., We very much appreciate your comments regarding your stay at the Swissôtel Makkah. It is always a pleasure to receive positive feedback. I will share your comments with our team. I am sure that this feedback will serve as an encouragement to all of our staff as we strive to continuously improve the quality of our services. Thank you again for sharing your experience, and we hope your next visit will be as pleasant as the previous one. The rooms need interior renovation as furniture has become aged and signs are visible. The toilet in the room with 4 beds is extremely small and also the finishing of tiles and fixtures is very poor. Also 4 beds rooms require 2 toilets or a much larger toilet. Dear Farooq M., Thank you for taking the time to tell us about your experience at the Swissôtel Makkah. I am sorry that your experience did not meet your expectations; please allow me to express my sincerest apologies. At Swissôtel, we strive to provide a superior service experience for every customer; therefore your feedback is very important to us. Please rest assured that we are taking the appropriate measures to address the problem and prevent future occurrence. We appreciate your sharing your concerns, and it is our hope that you will give us the opportunity to better serve you in the near future. Dear Asad A., We very much appreciate your comments regarding your stay at the Swissôtel Makkah. It is always a pleasure to receive positive feedback. I will share your comments with our team. I am sure that this feedback will serve as an encouragement to all of our staff as we strive to continuously improve the quality of our services. Thank you again for sharing your experience, and we hope your next visit will be as pleasant as the previous one. We absolutely enjoyed our stay here. The hotel staff was very corteous and understanding of our needs. We stayed in a Junior suite which was very spacious. The hotel offers complimentary wheelchairs. Dear Sabeen J., We very much appreciate your comments regarding your stay at the Swissôtel Makkah. It is always a pleasure to receive positive feedback. I will share your comments with our team. I am sure that this feedback will serve as an encouragement to all of our staff as we strive to continuously improve the quality of our services. Thank you again for sharing your experience, and we hope your next visit will be as pleasant as the previous one. Dear Nazim H., We very much appreciate your comments regarding your stay at the Swissôtel Makkah. It is always a pleasure to receive positive feedback. I will share your comments with our team. I am sure that this feedback will serve as an encouragement to all of our staff as we strive to continuously improve the quality of our services. Thank you again for sharing your experience, and we hope your next visit will be as pleasant as the previous one. Dear Ejaz R., Thank you for taking the time to tell us about your experience at the Swissôtel Makkah. I am sorry that your experience did not meet your expectations; please allow me to express my sincerest apologies. At Swissôtel, we strive to provide a superior service experience for every customer; therefore your feedback is very important to us. Please rest assured that we are taking the appropriate measures to address the problem and prevent future occurrence. We appreciate your sharing your concerns, and it is our hope that you will give us the opportunity to better serve you in the near future. Hotel it self in general is clean, very small room, Haram view has minimal view of haram. The word thing is customer service. Had a very bad encounter with a resiptionust during check Out name Hussam. Was very rude and had no idea about xutiner service. Dear Shadi L., Thank you for taking the time to tell us about your experience at the Swissôtel Makkah. I am sorry that your experience did not meet your expectations; please allow me to express my sincerest apologies. At Swissôtel, we strive to provide a superior service experience for every customer; therefore your feedback is very important to us. Please rest assured that we are taking the appropriate measures to address the problem and prevent future occurrence. We appreciate your sharing your concerns, and it is our hope that you will give us the opportunity to better serve you in the near future. Dear Mohammed M., We very much appreciate your comments regarding your stay at the Swissôtel Makkah. It is always a pleasure to receive positive feedback. I will share your comments with our team. I am sure that this feedback will serve as an encouragement to all of our staff as we strive to continuously improve the quality of our services. Thank you again for sharing your experience, and we hope your next visit will be as pleasant as the previous one. Dear Adel F., We very much appreciate your comments regarding your stay at the Swissôtel Makkah. It is always a pleasure to receive positive feedback. I will share your comments with our team. I am sure that this feedback will serve as an encouragement to all of our staff as we strive to continuously improve the quality of our services. Thank you again for sharing your experience, and we hope your next visit will be as pleasant as the previous one. I was surprised with the declining services in the rooms in terms of toiletries, body lotion smells very old, no teeth brush and tooth paste. Cleanliness below standard. I was talking very highly about Swissotel Makkah, but now I am disappointed. Dear Abdulhamid A., Thank you for taking the time to tell us about your experience at the Swissôtel Makkah. I am sorry that your experience did not meet your expectations; please allow me to express my sincerest apologies. At Swissôtel, we strive to provide a superior service experience for every customer; therefore your feedback is very important to us. Please rest assured that we are taking the appropriate measures to address the problem and prevent future occurrence. We appreciate your sharing your concerns, and it is our hope that you will give us the opportunity to better serve you in the near future.